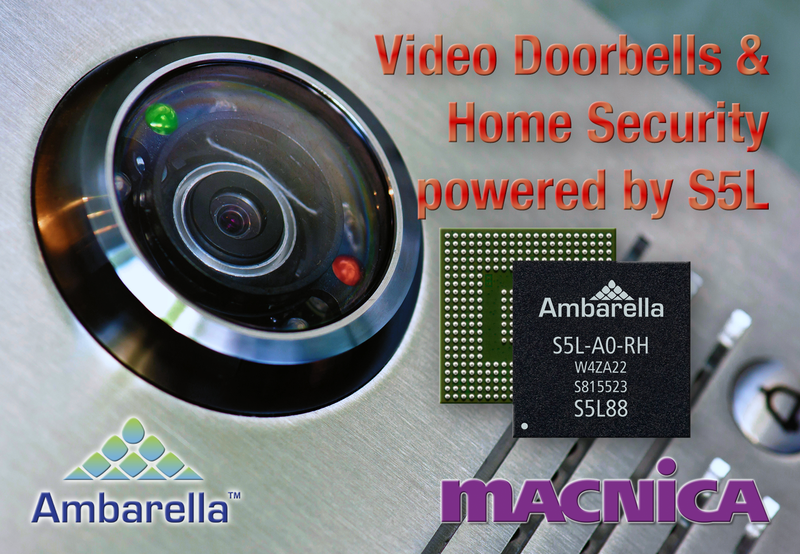 SANTA CLARA, Calif., April 3, 2017 — Ambarella, Inc. (NASDAQ: AMBA), a leading developer of low-power, HD and Ultra HD video processing semiconductors, today introduced the S5L and S5LM SoC (System on Chip) families to enable a new generation of 4K IP security cameras. The S5L is designed for professional IP cameras and includes 4K High Dynamic Range (HDR) processing, multi-streaming, on-chip lens distortion correction, and dual video inputs. The S5LM targets the home monitoring market, including battery-powered IP cameras and video doorbell cameras, and uses a single 16-bit DDR memory for low-power operation. Both chip families feature a quad-core ARM® Cortex®-A53 for advanced analytics, and are fabricated in low-power 14nm process. "S5L and S5LM address the full range of IP security cameras, spanning high-end professional models down to consumer home monitoring cameras,” said Chris Day, VP of marketing and business development at Ambarella. “With full 4Kp30 SmartHEVC™ video, HDR, advanced low light processing and a quad-core CPU, the S5L is an ideal IP Camera platform as the market moves from HD to 4K resolution. Additionally, the S5LM’s low power, advanced video analytics and excellent low light processing will enable doorbell and battery-powered cameras with the industry’s highest image quality and longest battery life." Both SoC families support Ambarella’s SmartHEVC™ (H.265) and SmartAVC™ (H.264) algorithms to deliver 4Kp30 video with bitrates as low as 512 Kbits/second, while maintaining excellent video quality. The HDR processing at full 4K resolution provides detailed video images even under high-contrast lighting conditions. Powerful quad-core ARM® Cortex®-A53 CPUs support smart analytics, including object and person detection, to reduce false alarms and maximize battery life in battery-powered designs. The S5L’s on-chip lens distortion correction engine supports wide angle lenses up to 180-degrees, while the dual independent video inputs facilitate seamless dual-lens designs. Both SoC families achieve extremely low-power operation and can deliver 4Kp30 video at under 1.5 Watts or full HD at under 0.5 Watts, making them ideal for small form factor and battery-powered designs. Ambarella, Inc. (NASDAQ: AMBA), is a leading developer of low-power, high-definition and Ultra HD video compression and image processing solutions. The company's products are used in a variety of cameras including security IP-cameras, wearable cameras, flying cameras and automotive video processing solutions. Ambarella compression chips are also used in broadcasting TV programs worldwide. Ambarella is the recipient of the Global Semiconductor Alliance 2015 awards for "Most Respected Public Semiconductor Company" and "Best Financially Managed Semiconductor Company," both with sales of between $100M and $500M. For more information about Ambarella, please visit www.ambarella.com. All brand names, product names, or trademarks belong to their respective holders. Ambarella reserves the right to alter product and service offerings, specifications and pricing at any time without notice. © 2017 Ambarella. All rights reserved.